Should Voting in the U.S. Be Mandatory? Ask any American what makes America great and there’s a good chance that they may say it’s our good old democracy. Then ask that same person when the next election is and they may look as lost as an abandoned five year old at Disneyland. Actually, our next nationwide election is three weeks from today, Tuesday, November 4th (please mark your calendar and vote!). In our last midterm election in 2010, less than 42% of eligible voters turned out to vote nationwide. So over 58% of Americans with the right to vote, really didn’t care much about having that right and perhaps spent their spare time that day choosing to catch up on their fantasy football team or binge watch The Walking Dead on Netflix (to be fair, some, especially the less-well-off, may be working two jobs that day or otherwise sidetracked by personal responsibilities). For those who believe in American Exceptionalism and in America as being the world’s greatest democracy, how can that be the case when these countries have greater democratic participation? The statutory penalty for not voting in these countries is typically a small fine. So what’s worse, making it mandatory to vote and minimally penalizing those who don’t (exceptions are always allowed) or having a kind of undemocratic government that’s not elected by a majority of citizens (and typically voters who are more middle and upper class)? 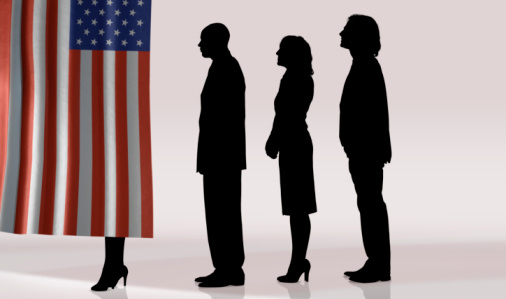 When one considers the nations where mandatory voting has existed for a period of time, it appears that it has made an impact on the culture, bringing citizens to accept that voting is something they need to do. And might not that sensibility, especially if it was infused into the poorer communities in the U.S. where voting percentages are at their lowest, actually empower them and pressure politicians to focus more on their needs and addressing poverty or be voted against? Not to mention focusing on the needs of the majority of the nation (and not on such things as repealing Obamacare for the 100th time or lowering the deficit when most people are struggling with employment and income). One can imagine the arguments against compulsory voting on both sides of the fence. From Liberals, the complaint could be that it would penalize the poorest since they are more likely not to vote. From Conservatives, we’d probably hear about how it is a core freedom of Americans to choose not to vote, “Those who don’t vote are proof of how great our democracy is!” (or some twisted up logic like that). Addressing the Liberal complaint, one could argue that if voting was made mandatory, then voting periods should be extended over weekends and for a longer time overall period and absentee ballots with postage paid should be provided to those who request them (making voting easy, without Voter ID laws in the way). For the Conservative complaint which would likely be hollow and just an insistence to keep the poor and minority voting numbers down because they are less likely to vote for Republicans, one could argue that what should take precedence is the social responsibility all citizens have to the country and to all who gave their lives in our history so there would be a democracy and a right for all of us to vote. In essence, those who don’t vote weaken our democracy and undermine the sacrifices made to give us that right. So the argument could be made that as members of a democratic society, they have a necessary and minimal responsibility to the nation support its democracy and vote. And considering that most of these people expect 1% of our citizens to risk their lives fighting wars to protect them and the country’s interests, it literally is the least citizens can do to support the nation. Those on either side of the fence are fine with requiring Americans to do something if they feel it is in line with their values. Most Democrats support the individual mandate on health insurance. Most Republicans support the mandate to provide proof of citizenship to use one’s right to vote. Laws are generally made to protect the majority at the expense of the individual’s freedoms. A compulsory voting law in the U.S. would do just that while reinvigorating our democracy and making it more representative of and responsive to the will of the majority of the American people. When I first came to Sydney, Australia from San Francisco, I scoffed at the idea that a “democracy” had mandatory voting. I was obviously younger and more naive than I hope I am now! I have worked as a returning officer in several elections in Australia and learnt a heck of a lot. 1.Elections are held on a Saturday -- sensible. 2.There is the opportunity to cast your vote at a pre-polling location -- very popular. 3.Absentee ballots are also very popular. 4. There is no need for ID, since your name and address must be stated to the returning officer and ticked off the register before you are given the voting papers. Yes, it is done by paper voting and there are scrutineers during and after the vote -- none of whom leave before the polling station is closed and the votes counted. There is still the ‘dunderhead’ and sheep vote but even if you live in a seat that is considered ‘safe’ by either party, your vote adds up and can make it less comfortable for the winning candidate. They then have to work to maintain their ‘safe’ seat! Admittedly, this is not always the case, but I have the personal satisfaction that I have registered my vote. Only 1920!! How can you deny yourself the vote when so many have struggled for so long to get it. And as for giving people an “incentive” to vote, like a tax credit or similar, that is morally reprehensible (IMHO). How about a belief system that demonsrates that you have a democratic society, that you have the RIGHT to vote, that you celebrate the fact that you do not live in a dictatorship and that you excerise your constitutional civic duty. Sorry, I really get on my soap box about people taking some responsibility and pride. After the 2010 Midterms and what could have been achieved……it makes my blood boil. Fergie, I agree with you. People here in America have stopped learning civics and don’t seem to have the pride in voting. To me it is not only my right to vote but my duty as well. I had civics class in High School and was eager to vote. Never have missed a vote and will always go and vote until I die. Thank you Nirek. Actually I’ve never taken a civics class in my life as a globe trotting student! But I think that it is a positive exercise to take such a class, for many reasons. I’m aghast to read that there are people out there who are actually saying that student IDs are not proper IDs because not all students are citizens! Well, of course they’re not. I wish these people would understand that you have to REGISTER to vote and your ID is only used to show you are the person you say you are. They haven’t even got a clue how voting works! Hear, hear!!! Very well said Fergie!!! Ad, excellent article. I have put my comments on the subject where appropriate. While I do support a national holiday, mandatory shut down of all businesses; obviously emergency services would still operate, as well as hospitals. I also believe that those who are unable to get to the polls, should be given access to an absentee ballot. After all that is how expats and the military, not stateside, vote. And with more corporations moved overseas, we have expats worldwide. Additionally, I believe that all ballots should be paper. And yes, we do have technology that gives a paper ballot even as one uses a computer to vote. In MA, we had an RFP (request for proposal) for electronic machines for the disabled, elderly, and those whose native tongue is not english (they are able select their language). Diebold attempted to sue the Commonwealth for refusing to give them the contract. They lost as they did not meet all of the criteria, paper ballots being one of them. Don’t get me started on their objection to having non-english ballots. We still have paper ballots, that are first run through a machine and are then spot checked for anomalies. If any are found, then those ballots are hand counted again for accuracy. Yes, we take it seriously in MA. After all, we got the ball rolling and we aren’t taught (at least when I was in jr and high school many millenia ago, lol) a revised version of the revolution because the scars are still very much all around us. Unfortunately, unlike most of the countries you mentioned, the US has two dominant parties, with third parties accorded virtually no chance of achieving high office. We also don’t have proportional representation--it doesn’t matter if, say, 35% of the electorate would support a progressive candidate to the left of the Democrat because our system is state-derived and winner-take-all. My votes for progressive candidates will not change the outcome of voting in my home district (where the Dems have locked down every election for over a generation). And with the Electoral college, it doesn’t matter what the percentages are--if a candidate doesn’t win the right combination of states, he or she will lose even after posting a voter landslide. I am all for the compulsory vote with perhaps some kind of incentive…. Amazing and so opportune article,AdLib. I will surely spread the world. And IMHO, the X generation OUGHT to have a strong civic curriculum…..
A co-worker, a newly minted citizen born and raised in South Africa, asked why she should bother to vote here when it seems that her vote would be meaningless. I replied that if the vote means so little, why are some people trying their darnedest to stop some other people from participating? I vote because I know what price was paid for me. I believe there should be some “incentive” for going to the polls — a tax credit, something. We have launched wars to help other nations secure rights that some among us would deny to fellow Americans. I like you realize what my opportunity to vote has cost. I believe in voting in every election, and whether or not I feel my vote will make a difference, I get the satisfaction of knowing that I had the opportunity to say what I felt as far as the issues were concerned and that’s good enough for me. Same goes for the candidates, since we can’t vote a negative on the ballot, the best way to oppose what you don’t like is to vote for the other guy even though he may be the lesser of the two evils. I too feel that if we are going to be mandated to vote, maybe an incentive for voting might be in order. I would lean more toward a national holiday where everyone has the day off and is allowed to use the time they need to vote and the rest of the time to relax or celebrate. The government might as you say also allow for a small tax deduction for everyone as well, that would be an incentive for everyone including those who are retired. MA, I believe that a national holiday that actually requires every business to shut its doors would be the best incentive to get more people to vote. I believe that it is also the reason that so many protests are easily quashed, no one has enough free time to express themselves. When losing even one day of work could make one unable to pay for the basics, we as a nation no longer have the American Dream. It is officially a nightmare. Past time for us to realize that we are our government and not participating is tantamount to cutting off one’s nose to spite their face. For the record, I have always voted in every election since I was eligible. I have felt that that is the least I can do as a good citizen. I agree with your idea that every business should shut down during election hours or even during the entire day for that matter. We should have a day to reflect on just how our government works, time to help us realize the fact that WE are the government, not the corporations or small businesses or any other entity that uses labor for the purposes of making a profit. One day out of the year for the citizens of this country should not be too much to ask. We could call it Patriots Day or Citizens Day or Civic Duty Day, whatever, but I feel a day to reinforce our democratic values and to allow the public to gather together on a special day to celebrate our democracy would be something that might bring back pride in voting, Civic responsibility and many of the other things we have somehow lost in this nation due to profit driven businesses and corporations. None of the national holidays are observed by business anymore, not religious, not government, none. Name a holiday that is observed by all in this nation…I’m hard pressed to do so, businesses seem to be open no matter what the holiday, and people who have to work for a living are required to work, holiday or not…sad scenario in this nation that claims to love democracy. Congratulations!!!!! You have a much better voting record than I do. Keep up the good work. Like you, Michael, I’m drawn to the “carrot” reward system rather than the “stick” mandatory system. And — let’s face it — the Koch folks on the right are going to complain about the “gummint” getting involved either way! I’m always baffled by people who say: “My one little vote doesn’t even make a difference.” It’s seems as though that’s almost the same as saying: “If I can’t single-handedly determine the outcome of this election, I don’t wanna play.” Which is basically kind of ego-centric, no? Mandatory voting without mandatory education regarding your vote is not a good idea IMHO. I found this video very interesting, it helps to explain why I feel the way I do. monicaangela, the video begins with a huge misunderstanding of compulsory voting so aside from the fact that it is purely anecdotal, it is wholly misguided. Here’s the main problem with the video’s approach, compulsory voting does not require anyone to vote for any candidates or measures if they choose not to. They can turn in a ballot that is completely blank or has only selected votes on it, where they have only voted for the candidates or issues they want to. I mentioned below, there used to be Poll Tests in the South, asking ridiculously difficult questions to prevent black and poor voters from voting. A democracy can’t be and isn’t selective about only allowing people to vote who are well informed. Surely, all people who will vote in November won’t be well informed. And there are many well-informed people who don’t vote because they are apathetic. I don’t think it would be accurate to assume that all those people who don’t vote are poorly educated or uninformed. In fact, many younger people who are very well informed, don’t vote for a variety of reasons. Why do you think the Repubs are instituting Voter ID in red states, to reduce voter turnout? Because the smaller the electorate is, the less representative it is of the people. There are no studies and no proof that I’m aware of that show that compulsory voting in the U.S. would lead to a less representational government or for that matter, government that was worse than what we have now under a minority’s choosing of government. In fact, the Repub fears of more voters (which no doubt is based on substantial research) reflect their worries that the more people who vote, the more Progressive the country would become. So, have to disagree with you on this one, IMO, one of the reasons our democracy has become so corrupt and unresponsive to the majority is that the majority is not represented by their representatives and compulsory voting would change that for the better. I did not say I would not like to see mandatory voting in the U.S., or around the world for that matter. I only said that if we do not do something to encourage people to get involved in politics before they vote, to learn about the issues and the candidates, compulsory voting may not have the desired effect. I believe as you do that if more people would get involved in government local, state, and federal, we would have a much better system. If mandatory voting is implemented, I would prefer we implemented something similar to the Fairness Doctrine so that those who do not have the time to search out the truth would at least have an opportunity to hear issues discussed from more than one viewpoint by opposing parties. I am working with voters right now, and many of them although educated, of age, and able to vote, are put off by the ads on the MSM, the constant onslaught of misleading ads that do not help them make a decision and the obvious gerrymandered districts where they realize their vote won’t count. Participation has never been something these people regret doing, some of them just feel the system is so rigged they would rather not vote. Some are elderly, some are hard working middle class citizens, and some are college students who have not registered or voted in the past. Many of these people agree to register and vote when they have been given the information they feel they need to make an informed choice. This is why I say compulsory or mandatory voting YES, but we should make sure ALL voters have easy access to information that would help them feel as though they have cast an informed vote. As for the video, I posted it to show what could happen if we had compulsory voting without proper access to information that could help those required to vote make an informed decision. MA, and that is the fallacy of this video. First, this was a Canadian experiment and none of the candidates presented would be eligible to run as they are all American. Second, the idea that mandatory voting automatically means that a larger portion would be going to the polls without having a chance to look at the candidates/issues is a bit hard to swallow. Every state does it different, but in Mass we get a pamphlet every election with the ballot questions. They present the issues, that would become law, and then both the pro and con view. It is sent to every home, regardless of whether one is a citizen and/or registered to vote. And yes, it is sent out with plenty of time to register if a particular issue resonates. When the decriminalization of pot was put on the ballot, the participation level was higher than the average election. I equate this “experiment” to polling, depending on sample size and those polled the outcome can be skewed to give the pollsters the answers they were looking for and therefore not a real answer at all. On the video, maybe it was a poor choice for this topic, I’ll give you that. I used it because I work with voters in my state before most elections. I work with a group that holds informational meetings for voters before elections. The group is more like a friendly gathering where we all discuss the issues and the candidates. Some in the group are republican, some democrat, some independent, and some from other smaller parties like the green party. I have heard many of those who come to the meetings express doing exactly what the student group did in that video when they get into the voting booth. Many say they vote for the person or issue they are concerned with, and then just guess when it comes to other candidates or issues. They do this mainly because they feel they have to complete the ballot or it will be invalid. I know that not every voter is uninformed when he or she goes to the polls, I was not trying to imply that. Having said that believe me there are many who haven’t had the time to search out the information they need to be an informed voter but still feel the need to vote, to complete their civic duty. When we started these meetings we thought we would get maybe 10 to 20 people who would be interested. We were definitely wrong, our one meeting has turned into many meetings throughout the city, and some are even talking about trying to initiate an effort to take them statewide. You’d be surprised at how many voters still don’t have the time or make the effort to become informed before entering the voting booth. Again, I didn’t use the video to say that ALL voters lack the knowledge to be considered an informed voter. I realize most voters are informed however I still believe we have far too many that are not as informed as they could be. I don’t believe that just because they find themselves in a situation where compulsory voting becomes the issue, they will miraculously begin to inform themselves. Many do not have the time to inform themselves, and do not trust politicians or the system to give them the information they need and therefore will just mark the ballot to complete their duty and be done with it. Mandatory voting although it is a good idea will not promote better government IMHO. It might even make the system worse. That is why I advocate more interest in getting information to the voter before elections, I call it educating the voter, but you can call it whatever you like, I believe we could do a much better job of informing the public without leaving it up to those who are trying to get elected or special interest groups that are trying to profit from issues and candidates that will do their bidding once they are in office. The idea of the video was to demonstrate what happens to uninformed voters when they go to the polls. Many of those in the experiment had no idea who the candidates were or what the issues were they were asked to vote upon. The kids in the video were showing that many times when a person is required to vote, they feel they have to choose one of the choices before them and often many will just guess because they think they recognize a name, or because the person on the ballot is more familiar to them than the other person(s) running in that category, it’s called name recognition, and many people use name recognition without knowing what the person behind the name really stands for. And, with the way our informational system in this nation allows candidates to lie with a straight face, and does not challenge the lies, it makes it even more confusing. That was my point, and it doesn’t matter where the video was made Canada, Africa, India, wherever, the principle remains the same. Yes, but the assumption of the experiment was that none of the voters would have access to information nor know who the candidates were in advance of an election. In essence, the experiment gave them the results they expected because they ambushed their friends, told them it was mandatory (without delineating punishment), gave them no information (as if all voters go into the booth and play pin the tail on the donkey), and just used words and names that would be familiar. That may be representative of some, not all voters. If it was, we would have had R majorities in all states for the past three decades. Not meaning to be argumentative, but creating a self-fulfilling prophecy and then saying “see I knew that would happen” does not a prophecy make. You know that’s the same logic the society used against blacks. “You are not smart enough or educated enough to vote”. I have a friend who never finished high school. I’d put his knowledge of domestic affairs and world affairs up against some I know with college degrees. IMO, the last thing we need in this country is literacy tests, again. Sure we need to improve education, but it’s a very slippery slop when we start talking about who is educated enough to vote. You evidently did not watch the video I posted, and did not understand why I feel mandatory voting will get you more participation but not necessarily better government. When I say a person needs to be educated before voting, I do not mean a person has to have a college degree of some kind before he or she can vote. What I meant was more along the lines of we need to stop allowing the MSM to allow politicians to lie with impunity about the issues. We need to become more involved with information we allow to be given to the public regarding the issues. I would even go so far as to recommend we discuss the issues in any and every manner we possibly can for the public in an honest manner. If need be we should actually have a real public broadcasting network devoted to explaining the issues and identifying the candidates and their TRUE position on the issues so that those who vote are informed voters and actually vote for the better candidate or better said for the candidate that would help improve the country. Maybe you should watch the video before commenting, and if you did then I suggest you agree to disagree with me and we will leave it there. I continue to maintain my position, your answer to my comment is a misinterpretation of what I am trying to get across here, it has nothing to do with literacy tests are anything remotely connected to something as heinous as that. I know the history of this nation and I would be the last person to suggest any type of slope that might lead to literacy tests or anything of that nature. Those of us who know the history of this nation realize literacy test are just another way for those in power to limit the vote. We also realize it isn’t the test, it is those who are giving and grading the test that is the problem. HI MA, Very nice reasoning in this post. SO Glad to see you posting again also. I hope you enjoyed the other songs one the project i passed along. I will be sure to send you an email RSGmusic. Good to see you here. I am enjoying them all, haven’t listened to one I didn’t like yet. I will let you know what I think of each one later. I’ll be in and out for a while, but will be posting regular soon. Ya life gets busy at times and posting get a little harder. I am so glad you like the ones you have heard so far. Yes i will await your note on them all but no real hurry. Please send the note via e mail when you finish listening. May good things happen to you and yours when needed the most. I watched the video. And we really try very hard on this site not to be condescending to those with whom we disagree. I never said you advocated literacy tests. You said “Mandatory voting without mandatory education regarding your vote is not a good idea IMHO.” I very well could have misunderstood your comment. But “mandatory education” leads to a very broad interpretation of what you may or may not have meant. I disagree with your statement “it isn’t the test, it is those who are giving and grading the test that is the problem”. So evidently you don’t have a problem with testing to see whom should vote. Or are you suggesting the test would be for some other reason? To me, tests of any kind are so far removed from democracy that, no, I cannot comprehend it. So, yes, we will agree to disagree. In regards to condescension, let me say I was not attempting to condescend. You bought up logic and determined the logic in the video was tantamount to literacy test. I explained in my comment that the type of education I was discussing had nothing to do with test. I believe we in this nation before even talking about mandatory voting should re-institute the Fairness Doctrine or something similar. In regards to my statement concerning ” it’s not the test but the person who is giving the test I was referring to those same Jim Crow literacy test you were referring to. “Southern state legislatures employed literacy tests as part of the voter registration process starting in the late 19th century. Literacy tests, along with poll taxes and extra-legal intimidation, were used to deny suffrage to African-Americans. The first formal voter literacy tests were introduced in 1890. At first, whites were exempted from the literacy test if they could meet alternate requirements (the grandfather clause) that, in practice, excluded blacks. The Grandfather Clause allowed an illiterate person to vote if he could show descent from someone who was eligible to vote before 1867 (when only whites could vote). Grandfather clauses were ruled unconstitutional by the United States Supreme Court in the case of Guinn v. United States (1915). Nevertheless, literacy tests continued to be used to disenfranchise blacks. The tests were usually administered orally by white local officials, who had complete discretion over who passed and who failed. Examples of questions asked of Blacks in Alabama included: naming all sixty-seven county judges in the state, naming the date on which Oklahoma was admitted to the Union, and declaring how many bubbles are in a bar of soap. I have no problem in Australia walking 15 minutes to my polling station every 4 years to elect the people running this country. No matter which side of the Red/Green/Blue lines one is, at least we get some say in our Representatives. Of course, gerrymandering and Big Business Bucks still play a huge part. But the fact that it is compulsory raises barely a murmur here in supposedly ferally independent Okkerland! If you don’t want to vote for any of the bastids, just turn up, sign in and then leave the papers blank. Oh, by the way, a nice thing that might swell the ranks in the US is that it is also illegal NOT to REGISTER to vote! So if you move states or address, you must let the Electoral Office know, otherwise you’ll be fined. Wouldn’t that stymie a lot of underhand practices! I hope it does happen. It should. PPO, great to have your affirmation on compulsory voting, as someone who’s familiar with it first hand. It isn’t an imposition at all, is it? It’s a responsibility, one of the few that apply to being a citizen in a democracy. And as you say, if people don’t want to vote, they can leave their ballot blank. No question that ending gerrymandering and unlimited campaign donations would complete the repair of democracy but those are long haul goals. In the meantime, we could get people out to vote and at least have a more representational government. And yes, if there was mandatory voting, that would naturally include mandatory registration. With those mechanisms in place, we should be able to have courts knock out all Voter ID laws. We have the same problem here in Canada AdLib. Voter apathy being the problem as I see it,the mindset that what difference does it make? The parties make big promises but rarely deliver. I suppose it could not hurt to make it mandatory,personally,having civics classes mandatory in junior high might spark more young minds to care more about the process and get involved. Beatlex, I think it’s kind of a vicious circle. A minority votes so politicians are elected who just pander to a minority and the majority whines that government is terrible so they don’t vote. I think if everyone had to vote, the quality of politicians and their philosophies would be different and things could get better. Only way to break that cycle may be to force a majority to vote and get a more representative government in place. AdLib (and Planet community), what do you think about giving people a small incentive to vote? Say a $10 credit on their taxes? Or — if they’re in a low income situation of being on disability or SS — maybe a $10 additional bonus to one month’s bank deposit? This would remove the predictable RW “Big Gummint forcing you to eat your spinach” argument from the picture, and make voting feel like what it really is — something positive and rewarding. Kes, actually, that would probably be portrayed as a government handout for paying people (especially those terrible poor people) for something they ought to do anyway. Well…the Repubs would oppose any approach to getting more people out there to vote. Naw, Kes. It would be seen as buying votes! Better is a documentary of the creeps currently in power, with the exhortation that if you don’t want these same nongs back in again, you’d better get off your arse and do something about it. How about a national holiday to allow those who work the opportunity to exercise their right to vote? Is it true that elections in Australia are always held on Saturday? If so, even that might be a better idea than our usual Tuesday in the U.S. Yes, MA, elections are held on a Saturday in Australia which is a much more sensible way of doing it. Of course stores and other businesses are still open on Saturdays, but it does allow for many more people to excerise their right without any inconvenience whatsoever. I’ve always thought that holding elections on a Tuesday is one of the most absurd ideas by those who set that system up. I believe the only reason voting hasn’t changed in this nation is because those in power don’t feel it would be beneficial to them. The Republican Party definitely does not want to see a change, their effort is toward limiting the vote so having the vote on a weekend when many are not working or having a national holiday for the vote would not be in their best interest. Like everything else in this nation, it is the voting public, the citizens that need to push the effort to get this changed. I truly hope some day the electorate will see the need for changing the manner in which voting is held in this nation. I also believe voters need to rethink the electoral college…it IMHO is outdated and not necessary in this age of instant information and modern technology. I believe it is time to revisit that decision since we are no longer an agrarian society, most farming in this nation is done by corporations and the time needed to travel to the polls etc., has been eliminated yet we still suffer under this antiquated law passed by congress. Of course today it helps those who would try to limit the vote so I don’t see it changing any way soon. Yes I know the background of Tuesday voting MA. I probably should have re-worded the last part of my sentence. It is WAY past time to revisit the original reason for Tuesday elections. As it currently stands that was 169 years ago! Why on earth wouldn’t it change any time soon? I’m getting frustrated with this backwards way of thinking. Adlib you may be on to something. Liked the article very much. More important to me is to overturn citizens united. Have very low limits on donations. No one including businesses can give more then 250 $ to a candidate or any pac or association to make advertizement during elections. Also all television and social media commercials in support of a candidate should be fact checked. THey can not be aired if they are not the truth. That is my look at things. RSGMusic, the thing about true democracy is it’s messy. Some people who already vote, are poorly informed while some who don’t vote are well informed. Democracy means that all people get to vote, whether they’re smart or dumb, informed or uninformed. There used to be poll tests, requiring people to prove a knowledge of American history and civics that was used to prevent blacks and poor people from voting. People do know what they like and what they don’t like though and if Dems do a good enough job communicating what they stand for, I think they would acquire more support from new voters by a large margin. Agreed Adlib your post is true, Thanks for the conversation. AdLid, I think voting should be required. I also think that people who have committed crimes and served time for those crimes should be allowed to vote. I know that’s true in some states, but I think it should be a federal law. Too many young men (especially young black men) will never be able to vote because they served time for WEED! I also think that there should be an Election Day holiday. Everybody gets off (except essential employees) and they should be give a day within a time frame that they could vote. Sabreen, that is part of the suspicious nature of harsh drug laws and selective enforcement against minorities, that red states also strip them permanently of just the right to vote. They can do just about anything else after they’ve served their time but what is the logic behind denying them the ability to vote, how could that harm anyone or anything except democracy? As to an election holiday, just speaking from a pragmatic POV, it would be hard to pass with all the corporations fighting that but if you could vote over the weekend, if voting was held over a full week, you wouldn’t need a holiday, you could find an hour somewhere in that week and corporations would have no legit grounds to protest. Ad, I think there should be mandatory voting. Every citizen should be required to at least lift a finger to fulfill their unspoken duty as a citizen. The highest % voter turnout in a midterm election since 1948? : 1966 with 49%. This is a chronic problem that’s persisted during our nation’s modern history. Is requiring citizens to vote, as their only duty to their nation, a burden? Can’t see how that could be. Of course the anti-democracy folks like Repubs and the Kochs would fight it but they would be blatantly on the side of tyranny. The apathetic culture your percentages portray has to be changed and if that requires mandating citizens to be responsible and simply take a couple of hours out of one day every two years to do that, how is that asking too much? Americans have become complacent or ambivalent about voting. Those who want to vote are also being restricted by some of the GOP’s tactics of making voting difficult for minorities. The ambivalent have my disdain. The minority folks who want to vote have my support! How can we get everyone eligible to vote to make the effort? I think you have the answer in compulsory voting, but that will never happen because the GOP would stop any effort in its tracks. The GOP seems to be the rich and powerful and they don’t want everyday people to exercise their rights to vote. They even claim (wrongly) that it is to stop voter fraud. There is no proof of any voter fraud. But that doesn’t stop them from lying. The GOP would surely fight compulsory voting but let them stake out the “pro-not-voting”, government without majority vote democracy. But why can’t we at least do this state by state? 99% of Americans never serve their country in the military as you did (well done, sir! ), I don’t think it is asking too much of them that every two years they vote their own interests. And those out there who whine about how bad government is can stop whining and take some responsibility for making it better. Ad, I’m all for it! lets make it compulsory for every eligible voter to vote, health being the only reason not to. No, sorry even those who are not healthy enough to vote can vote by mail! Now how do we get this passed as a law? Nirek, I totally support exceptions to compulsory voting due to legit health or other reasons. The idea would be to compel all citizens to vote and make it a positive thing. But lame excuses should be rejected and voting should take place over at least a 1-2 week period instead of a single day. Have to do a little research on this but I think states can make such laws if the Feds don’t. Maybe the initiative process would be the way forward?